Plumb Cellars is a new winery that was pouring its inaugural releases Fall Release Weekend. One of several winery-less wineries, Plumb Cellars was pouring at Merchants Deli in downtown Walla Walla (Note: Merchants has changed hands and is now Olive Marketplace & Cafe). Winemaker Megan Anderson-Pira is the daughter of acclaimed Walla Walla Vintners’ winemaker Miles Anderson. Plumb Cellars made their first wines at Walla Walla Vintners. The winery’s initial releases are a Merlot, Red Wine, and Cabernet Sauvignon (the latter was not sampled). On the bottles, the label is set off-kilter – an eye catching approach - with a plumb line running straight down the bottle. The winery will be releasing the 2007 Damn Straight Red Wine as well as a 2007 Syrah Spring Release Weekend. The Syrah contains fruit from the winery’s estate vineyard in the Walla Walla Valley vineyard, named Garvey Arthur, as well as fruit from Spring Creek Vineyard. Plumb Cellars also plans to have a tasting room open at that time. 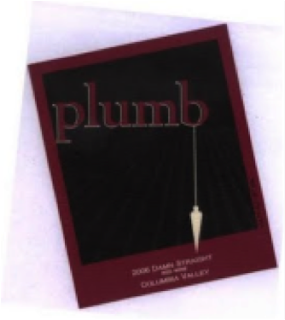 Plumb Cellars made 325 cases in their first vintage. The winery made about twice that for the 2009 vintage. Rating: + (Good) Nose is marked by caramel and spice along with red cherries. Tart and fruit filled on the palate. 14.8% alcohol. 75 cases produced. Rating: + (Good) Dust and a touch of tobacco mark the nose on this nice, bright, cherry filled wine that features chewy fruit flavors. 40% Merlot, 30% Cabernet Sauvignon, and 30% Cabernet Franc. 14.3% alcohol. 225 cases produced.